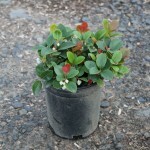 A spreading groundcover with light pink, summer blooms that are followed by red berries. The glossy green leaves turn burgundy in winter. 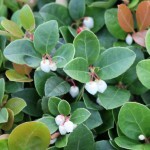 Berries and foliage have a wintergreen fragrance when crushed. It prefers an acid, well-drained, moist soil in partial shade. Also called Eastern teaberry or Checkerberry.